Imaginary short people fascinate us, and they take up an inordinate amount of space in literature and mythology. We’re all familiar with the Lilliputians who entrapped Gulliver, Snow White’s pals Dopey, Sleepy, Grumpy and the rest of the Seven Dwarfs, the Munchkins in the Wizard of Oz, the dwarf Mime in Wagner’s Ring Cycle, Rumpelstiltskin, and, of course, Tolkien’s Hobbits. Our driver, Antonius, had indeed spotted the tiny man and was already hitting the brakes. My Indonesian friend Boedhihartono and I hopped out of the car to introduce ourselves to a middle-aged guy named Markus, a perfectly friendly, perfectly articulate, otherwise normal-in-every-way man who happened to stand no taller than my waist. Illustrating that Americans have no monopoly on rudeness, Boedhihartono and I started grilling the short man about how he felt to be one-meter tall (“OK”), whether his parents were “normal” (“Yes”), if he knew about Homo floresiensis (“What’s that?”). “Just a midget,” Boedhihartono said as we got back in the car and left the village of Kisol. I checked later and found that about one in 40,000 children, worldwide, could be defined as a “little person”. Uncommon, but not as scarce as the rarities we were seeking. Most cultures relish their “short folk” stories. The Irish have their leprechauns, the Icelanders their elves, Hawaiians their menehunes, and Scandinavians their tomtar. Worldwide, people have given at least 200 tongue-caressing appellations to imaginary small folk, with some of the most mellifluous being abatwa, blue men of the minch, bugalademujs, and djinn, not to mention Issun Boshi, jimaninas, naiads, nereids, and nixies, and, lest we forget, pixies, selkies, sluagh, sprites, sylphids, vardogls, weisse frau, wichtlein, yumboes and zips. We had traveled to the eastern Indonesian island of Flores with a simple, albeit esoteric goal – to seek orang pendek, the Indonesian name for “little people”. These small people are the stuff of legends throughout Southeast Asia and Flores is a rich fishing ground for small-folk tales. But tales told around the campfire are no substitute for the real thing, and Flores, a dramatically-beautiful volcanic island of 1.4 million people that is 2 ½ times the size of Bali, is home to three items of particular interest to orang pendek researchers. The first reason to visit Flores is the discovery in 2003 of a child-sized creature that lived just 18,000 years ago (other specimens later discovered lived as recently as 12,000 years ago). The scientists who described the find declared these to be a new species of the genus Homo, and named the group Homo floresiensis. They said that these proto-humans, standing less than a meter tall (about the height of a modern three-year old American child), with heads the size of grapefruits and weighing just 25 kilograms, were contemporary with Homo sapiens, but were not direct ancestors of our species. The investigators dubbed the creatures Hobbit Men. The second trigger for visiting Flores was to investigate tales of ebu gogo, an orang pendek-like creature that inhabits the folk tales, if not the contemporary forests, of contemporary Flores. All three reasons for visiting Flores – Homo floresiensis, ebu gogo and real-life Hobbits, are variations on the idea that unusual small humanoids can be found throughout Asia. Reports of wild orang pendek (literally small folk), smaller tropical relatives of the more famous “yeti” or “Bigfoot”, have occurred frequently enough in China, Indochina, Peninsular Malaysia, Borneo and Sumatra to merit a skeptical inquiry. The orang pendek occupy a similar eco-cultural niche in tropical Southeast Asia to the Himalayan “yeti” which is said to inhabit the high mountains of Nepal. Philosopher-scientists have long speculated on man’s relationship with apes and “wild men”. Pliny elevated apes to “wild men”, and Leonardo da Vinci noted similarities between people and animals. Goethe discovered the intermaxillary bone in man and “trembled with delight” about the links this indicated between man and ape. Darwin at first, fearful of the fallout from creationists, avoided the subject of whether man evolved from apes. Human-like apes roam the territory of primal myth. Most of us sophisticated city-dwellers have separated ourselves from these remnants of the collective unconscious. But I’ve always been curious about what survival benefits myths and legends have for mankind as a whole. Among Asia’s forest people, who are in daily contact with “wild nature,” the various forms of ape-men are an ever present reminder of what it means to be man-like, yet not quite human. The creatures of the twilight world live in the forest, away from people, but people fear and respect both them and their forest home. The most important prehistoric archeological site in Indonesia today is Liang Bua (“cold cave”), where Homo floresiensis was discovered. The cave lies 14 kilometers north of the Flores town of Ruteng. Motorcycles or trucks can cover the last three-kilometer section of bad road, but of course one could walk, as we did. Although the archeological digs have been filled with dirt, Hendrikus Bandar, the “key keeper” of the cave, showed Boedhi and me around. The cave itself is in the form of a fat crescent, maybe 50 meters across, with several levels, opening to a green valley. It was almost too perfect; I could see the site being used as the setting for a cave man movie. In A New Human, a book written by Mike Morwood, an Australian scientist who has ben involved in the Homo floresiensis research from the beginning, and Penny van Oosterzee, the authors write that as Morwood was leaving Indonesia after a session of ten weeks of excavation in 2003, he jokingly asked Emanuel Wahyu Saptomo “when are you going to find us a pre-modern hominid skull” to go with the bones of pygmy elephants, giant rats and stone artifacts that had been excavated. His colleagues obliged and Rokus Due Awe, a 64-year-old paleoanthropologist from Flores, describes the eureka moment when they realized that they were dealing with something special. Digging at a depth of some six meters, Pak Benny, one of the researchers, had found a “whitish expression in the clay”, according to Rokus. In his zeal to see more, Pak Benny accidentally sliced off what turned out to be the left brow ridge of the skull of the first Homo floresiensis discovered. Pak Benny fortunately stopped his trowel-work and called Emanuel Wahyu Saptomo to have a look. Wahyu himself wasn’t sure what they had discovered and asked Rokus to have a look. “It’s a skull,” Rokus said. “Monkey or human?” Wahyu asked the older man. The skull was very soft, “the consistency of wet blotting paper,” according to Rokus. They cut around it and took the block of stone back to the Hotel Sindha. Before they could study the fossil the Ruteng crew had to harden the bone, which they did by buying acetone in the local drugstore, which they mixed with epoxy glue. The piece of the skull, of a female which was later named Flo, took three days to dry. The team had just made one of the most sensational discoveries in the history of evolution. People in this part of Flores tell stories about a sort of local bogeyman, the ebu gogo. Curiously, one of the possible origins for the English phrase “bogeyman” derives from stories about Indonesian Bugis pirates from south Sulawesi that British parents told their children to get them to behave. Ground zero for ebu gogo is the region around Ebu Lobo (“all ancestors”) volcano, at 2,149 meters a prominent and beautiful landmark. And the main story-teller about ebu gogo, which roughly means “ancestor which eats anything”, is Pak Epe, the Kampong Boawae headman who describes a creature with a hairy body, which lives in caves and eats raw meat and climbs vertical rock faces like a lizard. A female ebu gogo has breasts so long that she can flip them over her shoulder, he adds. Pak Epe tells a campfire legend he has down pat. He’s clearly told it numerous times before, and is particularly keen to show us a business card of a producer of the American TV show “60 Minutes” who interviewed him several years ago. Pak Epe estimates he’s about 69. He’s bald on top, with white flyaway hair on the sides. He has sparkling eyes and speaks in clear Indonesian. His story, which he claims is “thousands of years old”, is simple, albeit fuzzy. Once upon a time, a group of ebu gogo came into a village to steal vegetables from the gardens. For reasons that were not clear, one time they stole a five-year-old boy, who was raised by the ebu gogo. Years later, they sent the wild child back to the village to steal fire (shades of Prometheus), and he was caught. The villagers forced the boy to show them the cave where the ebu gogo lived and the humans proceeded to set fires which killed all but two of the wild men, who escaped to do something, somewhere. Boedhi and I agreed that, as origin legends go, this is pretty feeble stuff. No mythical elements, nothing mystical or sacred, just an old-wives tale that would probably sound better when told around a campfire with the rice wine flowing. As we leave Pak Epe requests a gift for his time. We give him a few dollars, and ask one last question. “Do the ebu gogo still exist?” “Probably not,” he reluctantly decides. There are many conditions and diseases that can cause short stature, according to Little People of America, a nonprofit organization that provides support and information to people of short stature and their families. By far the most frequently diagnosed cause of short stature is achondroplasia, a genetic condition that results in disproportionately short arms and legs; the average height of adults with achondroplasia is 1.52 meters. The website dwarfism.org says that this condition occurs in all races and with equal frequency in males and females, and affects about one in every 40,000 children, which means there are some 200,000 little people worldwide. Traveling with Boedhihartono is a bit like spending time with a full university faculty. Although his business card explains that he’s in the University of Indonesia Faculty of Social and Political Sciences, with a focus on tourism, his Ph.. D. from the Sorbonne in Paris is in human ecology, and his Berkeley post-doc studies were in paleoanthropology. And he’s a medical doctor. One morning Boedhihartono becomes a geology professor, explaining the difference between volcanic felsic and mafic lava flows, then he segues into a few words of praise about James Lovelock’s “Gaia Hypothesis”, explains why it’s bad to drink cold liquids in hot weather, and weaves in tales of his visits with the remote, magical and notably-xenophobic Badui people of West Java. During tea he explains the history of craniometry, and the difference between dolichocephalic, brachycephalic, and mesocephalic skull types. And after dinner he might take the role of a politically-incorrect history of religions professor, urging the Javanese to return to the glory days of the Hindu Majapahit Empire, stressing that Asians should follow Asian religions. And it doesn’t take much to get him to discourse on one of his favorite topics – cryptozoology. Boedhihartono thinks that relict tigers still live in Java (specifically not in east Java where they were thought to have most recently gone extinct, but in west Java) and seeks funding for an expedition. Similarly, he has been searching for orang pendek on the large Indonesia islands of Java, Sulawesi and Sumatra and on the smaller island of Bangka. Sammy Davis Jr., Mahatma Gandhi, Nikita Khrushchev, and Voltaire were short men, standing 160 cm, which is a couple of centimeters taller than Balzac, Buckminster Fuller, Yuri Gagarin, Paul Simon, St Francis of Assisi and John Keats, who were in turn relatively tall compared to Henri de Toulouse-Lautrec (150 cm) and the even more diminutive Alexander Pope (137 cm). Local people are proud of Liang Bua, and government tourism officials in the regional capital Ruteng are hoping that the Homo floresiensis nicknamed “Flo” will do for western Flores what Brigitte Bardot did for St. Tropez. The Ruteng visitors’ office has published leaflets and posters showing a rather fanciful drawing of “Flo”, and there are plans to pave the dirt road leading to the cave. There are also plans to construct a visitors center near the cave, but, according to Ardi Suardi, an economics professor at Komodo University in Ruteng, the local villagers who own this land are asking about US$ 10,800 for land that might be worth a fraction of that amount, and negotiations continue. After wandering around Liang Bua we visited neighboring Kampong Rampasasa, just a ten minute walk, to ask what they knew about orang pendek. We were greeted warmly, as is the case in most Indonesian villages, and escorted into the headman’s house, a large airless room with packed earth floor, half the size of a tennis court, which doubles as the community meeting hall. The headman asked if we would like a welcome ceremony, which came in two sizes: the Traditional Lite for $5, and Traditional with Rice Wine for $10. I remembered Boedhi’s warning in Jakarta to “”be careful what you eat or drink in the villages.” In the safety of Jakarta I had asked what he meant, and he vaguely indicated the possibility of magic and spells. But I happen to think that spells only work in the spellee believes that they work, and figuring we would get better answers for the extra $5, or at the very least contribute a bit to the local economy, we sat and drank, surrounded by the usual assortment of children, old women, and men who hadn’t gone to the farms that day. We were asked to introduce ourselves, and Boedhi did the honors. The head man repeated the potted bios back to his seated neighbors, and I whispered to Boedhi. I said this, of course, to enhance our dual stature and to show that we were men of science and not day-tripping thrill-seekers. Regardless, Boedhi still had me trumped. He was a medical doctor, and after a few swigs of rice wine poured from a large white plastic jerry can , he was swarmed with villagers telling them about their ailments. And then we asked the requisite questions about orang pendek. Have they heard any stories? Are they themselves descendants of the folks in Liang Bua? Are any small folks still alive? And so we set off up the hill. But what about really short people? Gul Mohammed, the world’s shortest man, died in 1997 at the age of 40. He was 57 cm tall, and weighed 17 kg. By comparison, Verne Troyer, the actor who played Mini-Me in the Austin Powers movies, stood at a statuesque 81 cm and Charles Becker (the actor who played the mayor of Munchkinland in The Wizard of Oz towered at just over one meter, while. By comparison, the Mbuti Pygmies of central Africa generally stand at less than 150 cm. Setting off up the hill is a common experience in Indonesia when searching for strange happenstances. In Sumatra, near Kerinci-Seblat National Park, I was looking for tiger magicians who could capture man-eating tigers by singing them lullabies. So I set out to seek tiger magicians, just as I’ve set out to seek men in west Java who can turn themselves into thieving pigs, and a tribe of giant white cannibals in Halmahera. Each time I get to the provincial capital and people will roughly point in the direction of the mountains. I’ll get to the mountains, where the villages become simpler, where there are fewer purchased goods, where there might not be electricity or plumbing, and the people will say: “It’s not us boss, you want those crazy dudes across the valley and high up the next ridge. Be careful, they’ve got magic.” So I keep on climbing up the increasingly narrow trail, and at the end of the line, far from the nearest road or internet café, and really out of cell phone range, I reach a small village and find people who are quite normal. They have families, they farm, they respect whatever spirits they think are important, they laugh, they cry. And once in a while, if I ask the right questions in the right way, and if I’m smart enough to figure out “what did that guy really say?” I get some insights. In a sense, the “over the next hill” attitude reflects the existence of orang pendek stories. By common understanding, people on the coast are handsome, smart and sophisticated. People in the outback are hillbillies. When you’re at the bottom of the social totem pole, how do you maintain your humanity? We define ourselves partly by what we are not. And these end-of-the-line folks have no other social groups to look down on so they create an intermediate creature, more-than-ape but less-than-human. These stories consolidate the value and integrity of rural folk, as well as helping to maintain some social control. From Kampong Rampasasa and Liang Bua we walked half an hour towards Kampong Arkel and then hitched a ride the rest of the way on a passenger truck to reach the top of the steep hill. Arkel is a small, poor village, without the impressive carvings, statuary, weaving and visible cultural richness found in some other Flores communities. It has no school. No running water. Sort of the end of the line. In small villages like Arkel the arrival of any strangers is reason to gather and gawk. The “Hobbits” were waiting for us, almost on cue. We were quickly introduced to four small people, none of whom was taller than 130 cm. They were the living Hobbits we had sought, the holy grail of our search. It was all too easy. Four members of the clan’s short family were on hand to greet us: Margaretha Ndindis, Petrus Bambut, Yohanes Jerahi, and Laurensius Jema. Other family members were living in different parts of Indonesia, they explained. Petrus, the patriarch, said he might be 100 years old. Boedhi was in his element, and asked him what he did during the “Japanese war”, referring to WWII. Petrus said that when the war started he had just gotten married but had not yet had children, which would make him about 20 in 1940, and about 85 today. Not 100 as he claimed, but a significant age in any case. Laurensius Jema is kepala adat of the village, the keeper of the traditions. He’s married to a woman of normal height and has four children; his brother Yohanes has five children. Their aunt, Margaretha Ndindis, was also of an advanced age, and she asked Boedhi for medicine to treat a chronic headache. Boedhihartono obliged, giving her a jab of analgesic on her bum, watched by curious villagers. His medical advice reflected his own personal beliefs – eat lots of pork and drink tea without sugar. While Margaretha was lying on the mat Boedhihartono got out his caliper and sliding caliber and measured the width and breadth of her skull, her nose length, the width of her mandible and jaw. He might have asked permission to take cranial measurements of the other three small folks, but I don’t remember hearing much polite discourse as Boedhihartono also measured Laurensius, Yohanes and Petrus. It was getting late and we had to decide whether to leave immediately in order to return to Ruteng that night or stay. I was prepared to stay – I had some energy bars, my hammock and a nearly-full water bottle, and argued that we had come all this way, and that these were the only Hobbits we were ever going to meet in our lifetime so what’s the rush. But for reasons that were logical but ultimately unsatisfying, we left Arkel late that afternoon. Boedhihartono argued that the village people were poor and would be embarrassed because they couldn’t feed us, there was no water, no toilet. And he speculated that they were getting bored by us, and we had already asked all our questions and wouldn’t get any more information. The unspoken sub-text was that Boedhihartono was tired and had a cough and wanted to sleep in a bed in town. On the walk down I asked Boedhihartono whether they were Hobbits based on their cranial measurements. “Well, they’re short people,” he answered, a touch too enigmatically. Mike Morwood thinks that Homo floresiensis might have been in existence as recently as 2,000 years ago, which would easily put it into the cultural memory of any people who had an unbroken presence in the region since then. The bay at Labuan Bajo, on the far western corner of Flores, is one of the most beautiful in Indonesia, dotted with islands and rock outcroppings. Local businessmen have built a number of small hotels and guest houses along the main drag, to provide accommodation to thousands of tourists who use Labuan Bajo as a starting point for a visit to Komodo National Park, which lies to the west, home of the famous dragons and world-class scuba diving. Emanuel Wahyu Saptomo, of the Indonesian archeological service, and his colleagues were staying at the Hotel Bajo, convenient, but hardly romantic or luxurious – they had no view of the harbor and the bamboo-walled rooms did little to stop the vroom of motorcycles zapping past every few minutes. Wahyu was cautiously excited. 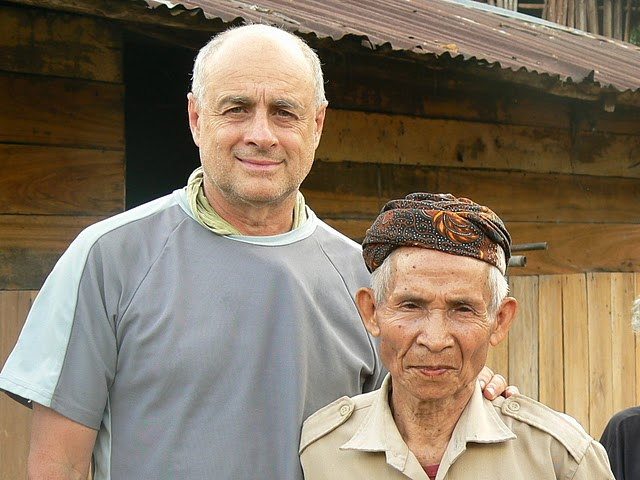 The head man of Rangko village, on the north coast of Flores, had visited them telling of an exciting discovery. Two young men had found a human skull in a cave. The head man was no doubt hoping that this was an anthropological discovery that would rank alongside the Liang Bua dig, and would therefore bring fame and not a little fortune to their small coastal community of 700 fishermen. We quizzed Wahyu about the possible importance of the discovery, but the discussion broke down into furtive whispering every few minutes while Wahyu periodically excused himself to make phone calls. Later he explained that he hadn’t been sure about whether I, having the odd distinction of being a journalist and a foreigner, could go with them to the village the next day, but his superiors gave him the go ahead with the request that if it turned out to be a big discovery I wouldn’t write about it until after scientific tests had been completed. The next morning we took a bemo to a neighboring village, and boarded a boat for a pleasant half-hour trip along the northern coast to Kampong Rangko. We climbed an hour up a steep hill to Goa Intan, “Diamond Cave”, so-called because when the walls are wet the silica in the stone reflects like jewels. The cave had graffiti scratched on the wall, in English, “wel/com to/ gua intan”. And the discovery? We found shards of earthenware pottery, shards of green glazed pottery, which Rokos identified as Yuan Dynasty, bones from a large rodent, some remnant human humerus bones, and the pièce de résistance, a large chunk of a human skull, which had been previously excavated by villagers. It took Wahyu about thirty seconds to burst the headman’s bubble. The skull was indeed human, perhaps 600 years old, and distinctly not of significant evolutionary value. But, being Indonesian and inherently polite, Wahyu promised to discuss the matter with his colleagues and report back to the eager villagers. I don’t know whether they were too poor, or too disheartened, but the fishing folk in the village didn’t offer us lunch. On our last day in Flores, an even more intriguing story emerged, again originating from the isolated northern coast of the island. Hearing of our interest in strange creatures, we met a gentleman named Pak Nico, who said that in his isolated coastal village one night he heard a screeching cry. It “sounded like something out of that dinosaur movie”, he said, referring to Jurassic Park, which apparently had made it’s way to the TV broadcasts of this distant corner of Indonesia. He did not see anything, but his fellow villagers swore they had viewed a frightening T-Rex-like creature which climbed trees and ate pigs and goats. It’s called marengket in the local Mangarai language, Pak Nico said. Boedhi and I were still skeptical, since tales of orang pendek and their ilk are frequent, but until you capture one you ain’t got nothin. But Pak Nico added that several years ago a villager had killed one of the animals but had neglected to keep the bones. Imagine, a relict dinosaur which lives on the north coast of Flores. And I know where it is – a long day’s journey in a four-wheel vehicle, then a couple of hours walk. Not far at all. I’d like to advise you about my new books and workshops (and maybe a few travel tales). I’ll only send these notices every couple of months. And I promise not to loan, sell or share your email address.